Native American Name: Get your Indian Name by Cherokee Namer (great gift idea! )Have you ever wanted an Indian name? Well here's your chance. Your naming assignment will be preformed by a respected member of the Eastern Band of Cherokees in the hills of western NC. Traditionalists follow and observe the rituals and ceremonies that surround traditional Native American life. This auction is for one very nice frame able certificate including your new Indian name. Will ship to Europe, contact seller for more details. Will combine shipping for multiple orders. Name that Unicorn! 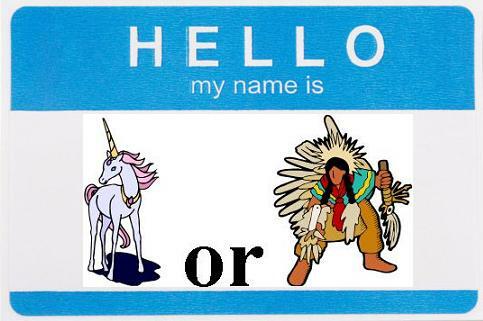 (or Native American)Say friends, do you have an unnamed unicorn or Native American just sitting around the place? Are tired of shouting “Hey! You there!” and not knowing which unicorn or Native American might respond to your call? Well fret no more! The Van Gogh-Goghs are here to do away with the endless, workaday drudgery of coming up with appropriate names for your unicorn or Native American! Thanks to the miracle of “science” combined with the Internet, you can name your mystical, special friend or unicorn easily and quickly! Needless to say, these sources of Native names are both ridiculous. The only difference is, one is a joke and the other is a scam. For more on funny Indian names, see "Bella Coola, Makes Us Hula!" and Joke About Chief WhoWouldhavethuinkit.